I don’t know why I resisted making kale chips for so long. For months, even years, I’ve been reading raves of this healthy snack from bloggers across the country, and the world. Maybe it’s this stubborn quirk I have. If too many people extol the virtues of something, I resist it. This is why I didn’t see Forrest Gump or Rain Man or The West Wing for years after they arrived on screens, large and small. (Actually, it was only the last one that made me curse this silly habit of mine.) It’s churlish and childish, but there it is. If everyone loves it, I’m not going to try it. Believe me, I know how infuriating this can be. My dear friend Gabe, who is a talented filmmaker, has spent almost twenty years resisting any film I recommend. He dallies in seeing the film that forces me to gesticulate and speak louder and louder as I recount the startling cinematography and the subtleties of dialogue that reveal character with the silences between words. He nods. I slow down. I’ve just grown too enthusiastic, I realize. Now he won’t see it. One night, years ago, we stayed up until nearly 4 in the morning, making a list of movies on stacks of paper napkins, the movies that made us remember how film can cut right through our hearts, urgently. (We had seen a film so bad we questioned the medium all over again.) At the end, I silently noted that at least 90% of the films were ones I had recommended, long before. And so, I’m not going to rave about kale chips. I’m restraining myself. Perhaps you’re just like me. I don’t want you to wait years to make these. I will share this: Little Bean loved them. See the olive oil and flecks of green on her fingers? She grabbed crisp leaves faster than I could photograph them. I wanted a full plate for the photograph. I have one with unexpected spaces instead. She ate half of them before we sat down at the table. These kale chips have a strange, mesmerizing texture. Want to know what it is? Potato chips. When you cook them just long enough, before they brown and taste bitter, the leaves shatter between your teeth. You taste the grease of the olive oil, the crisp of the chip, and the slick of salt on the tongue. For a moment, you might think you are eating potato chips. And then the last bite tastes like kale. These days, I prefer this to potato chips, any time. So does Little Bean. We’re lucky, in this house. Because of my celiac, we don’t keep a lot of packaged foods around. In fact, there are so few I could count them all on one hand. Sure, there are plenty of great gluten-free baked goods and crackers and cookies on the market now. Occasionally, I enjoy them, and I’m so grateful they’re out there. Mostly, however, it’s kale from the farmstand, flours in the cupboard, cheese and meats and ripe pears on the kitchen counter. This makes feeding a toddler an all-day job. I never seem to stop cooking and cutting, doing the dishes and planning ahead for the next meal. However, I’m lucky enough to be at home with her, to write in the evening when she’s asleep (like now). I can feed her every meal. Danny makes breakfast  this morning it was roasted potato slivers, leeks, bacon lardons, and scrambled eggs. I take lunch and dinner. Tonight, she and I shared warm brown rice, sautéed chard, a strawberry smoothie, and an apple. She lapped it all up, babbling all the while. She’s never had a Lunchables, a toddler meat stick, a lollipop, or a potato chip. As far as she is concerned, baked kale chips with smoked paprika garlic salt is a really exciting snack. We’re always looking for more snacks around here, though. Little Bean is going through a growth spurt and seems to never stop eating this week. What do you and your kids eat for snacks that makes them smack their lips and leaves you satisfied with what they’re eating? If you haven’t made these kale chips yet? Well, let me say in a small, restrained voice: do. Preparing to bake. Preheat the oven to 350°. Line a baking sheet with aluminum foil. Combine the salt, smoked paprika, and garlic in a small bowl. Wash the kale. Rinse the kale leaves, then put them in a salad spinner and spin until the green becomes a blur. Round and round, spinning and spinning  let the kale dry. After it comes out, dry it even more with paper towels. Those leaves should be bone dry. Oiling the kale. Put the kale leaves in a large bowl. Drizzle over 1 tablespoon of the olive oil. Massage the oil into the leaves. You might need more. You might have larger hands than I do. Use your judgment. Bake the chips. Arrange the kale chips onto the sheet try and slide it into the oven. Bake until the leaves are crisp to the touch but still a dark green. (When they turn brown, they turn bitter.) Check at the 12-minute mark, to be sure. Remove them from the oven. Sprinkle with the garlic smoked paprika salt. Let them cool a bit. Eat. Mini muffins. GF of course. My boys act like they are so much more exciting than regular-sized muffins, even though the only difference is the pan I use. (That pan is one of my best kitchen investments!) Me and the middle one love pumpkin muffins, the baby loves apple/oatmeal, and the big one harasses me for blueberry muffins that turn a crazy color of purple gray. Yum. I think I need to bake a batch in the morning! Wow – that's great that your daughter devours healthy, homemade foods as snacks, etc. I aspire to that reality in my idealistic child raising notions. Tinned chickpeas with a drizzle of good olive oil, a squirt of fresh lemon juice, a crumbling of feta cheese and a sprinkling of freshly ground black pepper. Likewise, I had heard so much of these I didn't feel too compelled to make them. But I finally did (for dinner during this week's LOST) and found them to be surprisingly good! I did not dry the leaves as well as I should so I had a few not-so-crisp pieces but I will next time. I though the stems were really tough and would de-stem the leaves next time. I used red kale, though, so maybe that's the problem. Love me some kale chips! Have you ever tried adding some nutritional yeast to them?? It gives them a cheesy, nutty flavor! Okay. You win. I will try kale chips! I've always wondered, but somehow couldn't believe everyone loved them. I thought of kale like spinach. Could you imagine spinach chips? Probably not. I'll rearrange my brain. You showed me the err of my ways! Thanks honey. yech, just the term meat stick make my stomach gurgle. I've made kale chips at the peak of our CSA season (out here in New England it is unfortunately short, still no sign of fresh local greens for at least four months), and loved them. My favorite recipe was a sea salt and vinegar one, which is weird because I really dislike potato chips flavored with that. Have you tried roasted garbanzos w/ Little Bean? I think M. Bittmann has a recipe in his How to Cook Everything Vegetarian. They turn out a bit crunchy and less mealy than when they are just boiled. Tossed in what ever flavor combo you like and its a delicious snack. I have been wanting to try these, but something – perhaps the same "too many endorsements" hesitation – has been holding me back. Unfortunately I don't have a farm stand to go to, but I'll have to grab a bunch of organic kale on my next trip to the market. Oh, I don't have any kiddos, but one of my favorite snacks are slices of banana spread with almond butter (and nut butter really). I went gluten free about 4 months ago, and I love your site. Not only are the recipes great, but you are a wonderful story teller. home made corn tortilla chips! buy the best corn tortillas you can, cut them in wedges or strips, line on sheet pan, spray with olive oil and sprinkle with salt. Bake at 375. 5-8 minutes. serve with salsa. my kids love veggies with a dip. i make some sort of dressing and whiz it in the blender or food processor with a block of silken tofu. they love it, and i know they're getting a healthy snack. also, apples and peanut butter (or whatever nut butter floats your boat). I lovelovelove bake kale chips and haven't done them in a while. Lately, kale has been appearing only in winter soups at our house. But this is such a nice reminder of how delicious those chips are. Julian, my son, is 6 and seems to be going through a growth spurt again. The kid doesn't ever stop eating. Last night we had a rare dinner out, and even after stuffing himself full of Mexican food, he came home and announced he was hungry. Dude, seriously?? So along with lots of fresh fruits and veggies, raw almonds, organic cottage cheese and jam, he's really obsessed with bread lately. And the cool thing is that I get to include him in the process of making it. The boy has become a master egg cracker and flour measurer. I feel like he appreciates the end result so much more when he's had a part in the making. Shauna, I just cooked some Treviso radicchio the other night and it turned crispy because I forgot it. It was delicious. I have some kale growing in the garden so I will try these today. Keep giving Lucy different things to try, out of laziness I cooked the same things when my kids were toddlers, and now they won't eat ingredients out of the ordinary, like kale. I know that one day they will though, like I did when I got older. "As far as she is concerned, baked kale chips with smoked paprika garlic salt is a really exciting snack." Oh, man, that DOES sound like an exciting snack. I love seeing the empty spaces where L. has been snatching up crispy kale. And I love hearing about the two of you enjoying a delicious dinner together. Iris's longtime favorite snack is salami. Dried fruit sometimes, and fresh apple slices. Lately nachos are a favorite: just tortilla chips on a baking sheet, scattered with grated cheddar, and baked until super-crispy. Whoa, now. What's a "toddler meat stick"? Yikes and yuck! nut butter playdough. the food that you fan play with, then eat. we wash our hands and the table then they get to build whatever animal/character/weapon (i have a five year old boy) they choose, then they consume said object. snack and activity all in one. ka-pow! oh and i resisted west wing, too. then fell so madly in love with that show i had a hard time seperating my own reality from that of the WW characters. it was an issue. i kid you not. my husband still plays the theme music for me when he's trying to butter me up for something…..
Kathie I’m a Wing-nut too! We had a big party for the last episode…wish they’d do a reunion show! You sound like you've had a bit of sleep recently. Woo Hoo! Or is it more coffee? We make popcorn with coconut oil. Also every evening I make a small platter of raw veggies and we all munch on them as dinner cooks. A small bowl of tahini or almond butter makes a good dip and gives a great calcium boost. Porridge with ground almonds added is a good filling snack too. I don't have any kids myself but when I used to nanny the little girl I looked after loved anything small, perfectly cubed cheese, small slices of celery with peanut butter, mini muffins were a huge hit, basically anything she could easily eat with her fingers made her happy. About 50 things are zinging through my head! Like "Hooray! something new to do with that lefover kale!" "…must make piles of smoked paprika garlic salt and find many, many things to sprinkle it on…"
"I thought I was going to end up the only person in the universe who hasn't seen Avatar, but now I know you'll be right there with me." "What on God's green Earth is 'a toddler meat stick'!?!?" That phrase almost made me glad I dont have kids. Almost. I have some of that same strain of resistance. I avoid the big movies that everyone is talking about, but sometimes I find myself disappointed after I see something that has been so hyped. Maybe it is better not to rave too much about some things and just to let others try them when they are ready. I buy very few packaged foods and sometimes find that snacks are the hard part — coming up with something quick and delicious. I usually eat a few handfuls of almonds. I have recently been brushing spare corn tortillas with a bit of oil a sprinkle of salt and baking them into delicious tortilla chips. Probably not practical price or time wise, but they taste really good. Nori chips. Oh god, they're good. Mark Bittman has a nice post and video about them over at The Minimalist. Another snack extoling the virtues of nutritional yeast..
Chop and wash a head a cauliflower. You can roast it this way too, but if my kiddos like a raw veggie, over a cooked one, I'm not complaining!! I have had kale chips… they are divine. I keep forgetting to make more. So thanks!! Oh my gosh, my son and I looooooove kale chips! They're so fast and easy. We use them as a reward for when he's good at school. Every time we go to buy produce, my son starts yelling about how we need more kale! They upset my tummy a little when I overindulge. But boy are they worth it. My parents will be visiting soon and I will definitely be making them some kale chips! Thank you for reminding me how lucky I am to be home with my kids and the sole "cooker" of their food. I started getting overwhelmed this past week when my twins (6 1/2 mo) started eating solids. Suddenly it feels like, between milk and solid foods, I'm feeding them ALL DAY. This means I'm not giving my 4 year old quite as much attention and I'm not feeding myself quite as well…but I know this is temporary. It just takes some getting used to. The upside is that they love the pears and sw potatoes I made them. This makes the current struggling totally worth it. I so look forward to the stage your kid is in, that love of finger food! My daughter ate anything and everything – and to this day does not care for or have much of a knowledge of processed foods. She's not as adventurous as she was at 18 mo, but I know kids go through phases. One thing she is really into is "cheese party." Basically just cheese (she eats brie, sharp cheddar, you name it), crackers (which she hardly touches) and some kind of fruit – usually apples or pears. Again – thank you for this post – it was timely for me and it feels like I can take a deep breath and give this another try. The paprika & garlic sound yummy. I'm going to have to try these again. I didn't like the recipe I was given previously. Hi Shauna: I've been a food blog whore for years, but I don't think I've come across the ingredient "granulated garlic." What is it? By the way, churlish is one of my favourite words, and I try to use it; although I must say I feel a bit like a Victorian when I do so. I love that you used it…up with old words I say! I do this very thing – resistance of popular. Well everything except food. I have a similar post to this where I explain on and on why I let myself get sucked in to LOST. We are currently enjoying Kale chips as well, but I need to try the addition of smoked paprika. The kids have been requesting home made salsa and chips a lot lately. Also the citrus around here overfloweth and the kids love it. I just love those chubby little olive-oiled toddler hands. Just wonderful! Glad to hear you've come over to the other side…welcome! I spend way too much on the raw bags of kale with nutritional yeast at Whole Foods. I'd love to make my own. I too adore this type of snack over chips. Aside from the GF part, I could have written this post. Okay, you are much better at it than I could be. But I have the same habit as you and we cook the same way for our kids. My Monster is very fond these days of her own version of a snack plate. It changes every day, but if you didn't know better you would wonder if she was pregnant because it always involves pickles and honey. Seriously, lay out a plate with a crisp apple, some honeycomb (an all-time favourite), homemade dill pickles or pickled asparagus, and a sharp cheddar and she is happy. Or bread and butter with honey on the side. PS I adore kale sauteed with bacon to top my pyrohy. Baba would be proud. Keep the healthy snacks going as long as you possibly can! Bella ate so well until preschool when she was given all sorts of junk. The kid is crazy about artichokes though, so I can always get her on the right track with one of those (especially the heart – don't get me started on how many that kid has pilfered from me after all my work on the leaves). I also do artichoke dip (blitzed artichoke hearts with lemon, parm, garlic, parsley and veganaise or cream cheese) for her with veggies as well as guacamole. So good! Oh my gosh you could not have posted this at a better time for me! I'm thrilled to see ll of these ideas. (It's funny too, my toddler was eating kale chips as I started reading this). My son who is 19 months has multiple food allergies and I am really feeling at a loss for ideas for him. Every time I look at food idea lists they are all ideas like peanut butter sandwich, cheese and crackers, yogurt with berries, and he can't eat any of these. Your readers really posted some good ideas on here that I'll have to try. Right now we are in a rut of hummus and crackers, hummus and vegetables, hummus and chips. Yesterday I discovered sunbutter which is like peanut butter but made from sunflower seeds and he loves it! I haven't tried to make it myself but it's on my list to do. Thanks again for this post! I have been inhaling garbanzo beans roasted till crunchy with cumin, cayenne pepper and garlic powder. I gave up fried food for lent so I keep trying to find foods that fill the crunchy/salty cravings. This is brilliant and I definitely will try it! I also enjoy toasted chick peas… yum! I am so glad that little bean enjoys the kale so much. But it makes me long a little for the days when my boys would eat anything I gave them. Now that they are school age, it is difficult to get them to eat anything healthy. One only eats ONE kind of veggie, even though we offer a ton of variety. One finds all kinds of protein disgusting and the other, all kinds of breads unappetizing. Quite frankly, sometimes I want to clean out the entire kitchen and start all over again; hoping that they won't starve or binge on junk when they aren't at home (b/c they don't have access to it here). Do all you can to help Lucy see that she has it good, really good. MMM, kale! My 22-month old twins love their kale chips, but the two things they ask for every day are "mame" — steamed edamame with a hint of mexican chile lime salt and "ooo-me-ooo" steel cut oatmeal with nutbutter and raisins. I never thought I'd have to ration the green veggies, but broccoli and cheese is a reward for them after they've eaten their pasta/sandwich/tofu pup/what have you. It is great to (so far) be avoiding the pickiness that seems to be plaguing the Lunchables set. So funny. I'm similar in not wanting to try something if it's rave-about-good…but I must admit to making these last year after running into the recipe a few times. And they are so delicious and simple, and the kids love them too. Perfect for the "ummm, what was I going to do with the rest of that kale?" question that pops in my mind each month. Thanks for sharing such a wonderful blog. I just started my own blog at long long last, and will I'm sure at some point point my readers your way. Take care! I didn't have great luck with kale chips– the edges were so crisp that they crumbled into tiny pieces when I picked them up, while the middles were not totally dried out and got mushy if not eaten right away. Maybe I need to try again with lower heat? The flavor was fantastic (to me, anyway; no one else liked them). Whispering "thanks" for that little "do", as these have long been on my list of "really, must try, yesterday if not sooner"
Snacks are so funny, something that's veered into a meal unto itself. All 3 of mine choose differently, but all basic whole junk: fruits of all kinds, sliced into bites; all manner of cheese, cubed and in candles; tortillas, toast, sandwiches; eggs, hard-boiled and scrambled; littler servings of last night's supper — soups, rice, bits of beef or chicken. Beans of all shapes and colors, often canned, often not. Frozen berries, in winter, are beloved by all (straight from the freezer, blueberry and raspberry, especially) Yesterday's snack request was polenta, doused with parmesan. Smoothees go down famously. Nothing fancy, nothing complicated, all good. Thank you for your website and book. I went GF ..hmm. about one month ago. I've had stomach problems my entire life..oh minus this last month 🙂 It has been a great discovery I read your book in a week and am so excited to try some "new" foods 🙂 I have been making sorbet lately … all with fresh fruits and yumm very good for the sweet tooth! 🙂 anyways thanks again! We are right now nibbling on string cheese and carrots. The other thing they like is apples dipped in sunbutter (one of my sons has a peanut allergy so that dictates keeping things simple too. I am the gluten free person and I keep it simple too. Fresh fruit, smoothies, freeze dried bananas from Trader Joes dipped in sunbutter is yummy too. We buy very few processed snacks here, but when I desperate and out and about Enjoy Life brand snacks are perfect and safe for the kids and me ;)! We love yogurt as a snack too. When I am hungry though since I am still relatively new to gluten free, I am sadly very satisfied with a bowl of Rice Chex with Soy Milk. That may change someday, but for now, it satisfies :)! Oh the joys of introducing real food to a child. I never could figure out why friends thought it was weird to feed a kid real food. My girls enjoyed bonzo (garbonzo) beans almost from the start, sometimes with dressing or dip but far more frequently just cooked and cooled. They loved avacados, mame (edamame) celery sticks with peanut butter, And Kale chips. I always made mine with a bit of tamari sauce and peanut oil but yours sound so good too. I'm a busy single working mom and I've found that one thing has serviced our meals, snacks, and packed lunches…at the beginning of the week, I cut two covered platters up- one with fruit, and one with veges. We're lacto-veg, and often throw cheese, yogurt or "mames" into things, but nothing quite hits the spot like a few vege sticks after school…with tofu "sourcream" dip! I LOVE kale chips. The first time I made them I probably ate an entire head of kale in a couple of hours (and this was farmers market heads still on stalks, not grocery store mini-bunches). I do find that removing as much stalk & vein possible makes for the best texture, but even when they aren't great, I love that I'm having something so much healthier than potato chips but getting the same crunch. We don't have kids yet, but I aspire to follow your lead with them when we do. I've been hearing about these "kale chips" and was pleasantly surprised to find them on your blog. I can't seem to eat enough kale these days and I think these will make a great snack. I feel like I've been missing out!! Kale chips! I must try this!! GF mini muffins will be devoured instantly in my house. Add in some rehydrated dried fruit (cherries are the fav), mini choco chips and finely chopped walnut and they're gone. Shauna, you are a true inspiration. Articulate. Creative. And darn funny!! I, too, have been resisting the kale chips — but I have kale in the fridge now (my favorite for juicing), so I'm off to make them RIGHT NOW. Enjoy these days with Little Bean — once they hit preschool and playdates, the sweets and packaged goods are introduced (why???). But I am happy to report that my daughter would choose an apple over fries any day, and she hand picked carrots and celery, a smoothie, and a pineapple spear at Disney World over all the other junk there! Yayyyyy for healthy kids! I haven't tried Kale chips…or even heard of them before. My first reaction I must admit is to recoil in sheer distaste. But after reading everyone's rave reviews I will just have to try them! And I will never understand why it is we refuse to do things just because its what everyone is reading, writting, or watching. LOL I'm the same way! If I can ever figure it out, I'll let you know! Oh, thank you for posting that recipe! I'm also a Resister, mostly when it comes to tech stuff (so no iPhone, flip, Avatar, or Twitter for me). Usually am not so stick-in-the-mud when it comes to food, though, so I should have been on this particular bandwagon ages ago. Oft-requested snacks here: popcorn with nutritional yeast, apple dip (natural peanut butter, plain yogurt, and honey blended together, also yummy as a dip for carrots), frozen blueberries, and raw tofu, with or without a splash of tamari. Just a little bit of ground buffalo is so much protein for a growing child. Little meatballs are so easy to make. Ravioli would be great. It can also be added to pasta. I would usually buy the frozen burgers at Trader's and thaw. I just did not want to serve that much at once because of the high protein content. -rice mixed with maranara and cheddar. -sunflower seed butter on apple slices. -eggs in the basket. Take a slice of any healthy bread, and use a glass to take out a hole in the middle. Fry it with an egg in the middle. Use the holes for round sandwiches later in the day. So, H is a huge veggies fan too, but I haven't tried the chips either, though I will now! But this post is what finally made me do it. OH WOW they are delicious. I'm sold. my family loves kale chips. a favorite snack here is roasted chickpeas. toss with olive oil, salt, curry powder, a pinch of sugar – roast until dense & a bit chewy. gonna try these kale chips this weekend. has anyone suggested Date Balls? easy-peasy … 3:1 dates:nuts … any nut will do. i add vanilla, zest of some sort, and nutmeg or cardamom. and sometimes choco-chips. let the food processor do its magic. form into balls and roll in coconut. yum. Growing up in France, we never had any snacks. We had three meals (breakfast, lunch and dinner) and a piece of bread with Nutella or a piece of chocolate for the gouter at 4pm. Moving to the US was a cultural shock when it came to feeding my children. They were surrounded by children eating any kind of snacks at any time of day. And then parents complained that their children were picky eaters… but the same parents had just given a 150-calorie portion of processed cheesy-flavored crackers about 1 hour before lunch time! I don't condemn snack; I just think that we have to "manage them". A child has to be hungry when she comes to sit at the table for her meal. If need be, a snack has to be "part of her meal" : a piece of bread, fresh fruits, vegetables, yogurt… but not high-calories-high sugar-no-nutriments snacks. So, my favorite snacks? Edamame, carrots or celery sticks, fresh apple slices (for a young one, you just put them in a microwave for 2 minutes so that they are a little bit cooked but not mushy), fresh blueberries, grapes, a piece of bread, dried apricots, almonds, grilled chickpeas. Socca! It's so easy to make because it's just chickpea flour, water, salt and a tiny bit of olive oil. The key is to make it very thin in a really hot oven. You can chop herbs to put in it. It's great warm or room temp & the batter can stay in the fridge for a day or so. My favorite GF brunch food is Socca with finely chopped swiss chard and onion baked into the batter with baked eggs on top. Divine! Gotta make those kale chip! Oh before I extol the virtues of Kale chips let me just say…when I open your posts I sink into this world of goodness and health….your writing, your descriptions….your lifestyle is uplifting and encouraging to all out there! Truly, it is like escaping to a better place! I admire you and your husband for making a lifestyle choice for your little family…and dear little bean…grin…is the biggest beneficiary! Okay….now kale chips. Only tried them once and with great great love for them….but they were at a party of a friend of a friends and I forgot about them. Well, now…here I am and I am going to make these! Yummers! My kids loved cucumber boats. I would cut a cucumber lengthwise and scoop out the middle a bit. Tap it dry with a towel and fill with cream cheese or peanut butter. Top with chopped toasted nuts or raisins. This was thier favourite snack. I'd also strip the strings off the outer part of celery stalks and then fill them with peanut butter and raisins or currants. I think it was called, "ants on a log". They thought that was funny. I also used to soak tofu cubes in orange juice for a few hours. Drain and it's quickly gone with little fingers. We have a food dehydrator and my 15 month old who is teething loves banana chips and candied pineapple. Now I guess I'll have to give kale chips a try. My grandma made these for herself and I and is now one of our favorites! Funny, I spotted kale at the market today and told my fiance I'd been curious about "those kale chip things I've been hearing about." Two small bunches went into the basket; two hours later I read your post. I'm not sure what "lacinato" kale is, but I presume it means "kale that's much less curly than what I bought". My uber-curly kale chips weren't exactly a success (the edges crisped and browned before the interior could cook), but I'd hardly call it a failure. I'll happily gobble down this batch and will be sure to try this again with some more cooperative leaves. Also, I used a convection oven – not sure if maybe that helped the edges cook too quickly as well. For a quick snack, how about pepitas pan-toasted in a little light olive oil and salt? Om nom nom! We love kale chips! My husband and I like them crumbled on top of rice. At Lucy's age, Abigail would devour homemade sweet potato fries. I would scrub the sweet potatoes, cut them into fry shaped pieces with the skin still on. The toss them with some olive oil, cumin and paprika. Then, cook them in a 400 degree oven until done. Abigail also used to love sauted spinach and red pepper pieces. Another favorite in our house is turkey meatballs…basically ground turkey, gf flour, egg, and parmesian cheese. Shape in to balls and cook in over at 425 until done. Hi Shauna. I had to tell you I just started reading your book and I can't put it down. I was just diagnosed with celiac disease in December and it has been quite the process for me. Your descriptions of food are brilliant and creative. You can tell you are so passionate about what you do. It has not only been a great read but a tremendous help and resource as well. I am really looking forward to your cookbook next. Thank You! go you for eating seasonally! I just made kale chips the other day for the first time. We got some great looking kale in our local coop this week. I almost felt guilty eating them as I finished off an entire head of kale myself. snacks I keep around for my 14 month old toddler?? bananas, avocado, raisins, hard boiled eggs, plain yogurt, marys gone crackers, gf cheerios, lots of meat/veggie combinations like stews, stir fries..he's not big on grains though, which I'm okay with! I had a request for Custard yesterday afternoon. We haven't had custard for a while as it is summer in New Zealand. And since last winter we have cut out dairy in my son's diet. I know you mentioned little bean doesn't do so well on milk either. I have been maiking my own rice milk – recipe found on the web. It is tastier and way cheaper than the bought variety. So decide to make custard from scrathed with homemdae ricemilk and it came out pretty good – I did add a table spoon of ground almonds at the last minute (I am trying to boost the calsium intake) And I think it helped with the flavour. Now I am going to try again making my own mayo – I have just watched the video. I have never had sucess with mayo so hope watching your video has helped. Pretty soon we will not be eating anything readymade. I've been blogging for a little while and just started a foodie blog. I wanted to check out some other food blogs and came across the Times list of 50 best ones. I found most of them seemed a little bit cold and commercial apart from two. (Athough I didn't check all of them.) One was Chez Pim the other yours. I was initially drawn to yours because my neice has coeliac disease. But once I started reading I was hooked by the warmth and honesty of your blog….I'm now following both blogs….please don't change cos I think I really like you and your family…….  Tofu slices with artichoke dip (use PAM and fry thin-ish slices of firm tofu on both sides until lightly browned; then spread dip on top and eat warm. YUM!  Yogurt with nuts, granola, GF granola, etc.  Art pizza: big tortilla (brown rice is GF), paint brushes that they only use for food, condiments for painting (ketchup, hummus, etc. – can add dye to white stuff), and sprinkles and toppings (sliced olive, shredded cheese, cheese they can cut up, etc.). Try to only offer flavors that somewhat go together! You can also put your oil in a spray bottle which makes spreading it quicker. Could just eat up those little chubby Bean fingers!!!! 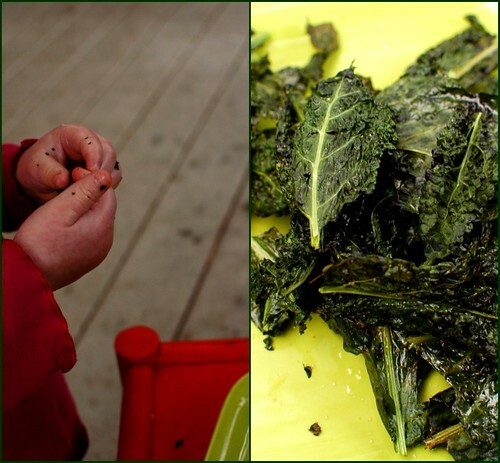 I loved reading this post today but I have to tell you the picture of little bean with flecks of kale on her fingers melted my heart. I admire your willingness to go public with your disease, your sheer bravery in sharing your life with total strangers, and the utter hope that I take away from this site every time I read it. Kale chips!! What a fantastic way to get a toddler (and a daddy…) to eat an awesome vegetable. I think our daughters are about the same age and I'm thrilled to be able to offer her a tasty treat. She likes sauerkraut and pickles, so I'll have to try the salt and vinegar idea. Thanks! My hubs didn't like kale chips when I tried them last summer, but I sure could eat them forever. I haven't made them again, but I need to b/c I bet my now-20-month-old daughter would lap them up. I'm working on an eBook called "Healthy Snacks on the Go", so I have to ask: have you tried taking these "to go"? I have a feeling they might not keep very well and are best fresh, but they would be an awesome addition to add to my book. I'm reverse engineering larabars like mad over here. 😉 Got any other portable snacks I should check out? I wouldn't use it in the eBook w/o asking permission, of course. I hate to admit these are super yummy. I understand not wanting to do something JUST because everyone else is. I am the girl who has lived in California for 20 years and has never been to Disneyland. Don't plan to take the kids anytime soon either. I am super excited to try these. I went to the farmers market today after reading this post last week, I had these chips in my head and I will be making them as soon as the oven preheats. Love your blog. Oh goodness these were fantasic! I made a couple of trays, thinking I would break them up through a warm autumn vegetable salad (it's autumn here!) – but I ate the first tray as I was sauteing courgettes. Why would anyone, ever, buy crisps? The remaining chips did add a lovely crunch to the salad, a slight bitterness against roasted beetroots and peppers and goat's cheese and courgettes. Had to come back & mention that even though I was already making kale chips, the addition of the smoked paprika was life changing:) I am now putting it on almost everything!! My 3 kiddos love kale chips too! And homemade hummus. I have so much Red Winter Kale in the garden right now, this is the perfect idea – Thank You! I LOVE this recipe! I've had kale chips before and enjoyed them but i was craving something more than just salt on them. Many people suggested Parmesan cheeses and such but as newly diagnosed with Gluten Intolerance I have to stay away from dairy for another 2 months. I love the spice blend you created here and really enjoyed the flavor it added. What an interesting homemade snack! I'm new to this gluten-free diet and am just starting off looking for gluten-free products at stores, such as the Cassava Chips at Trader Joe's. I like these because they're pretty similar to the regular potato chip but they're much healthier and more satisfying in my opinion! And I don't feel guilty eating them. Thanks for the healthy snacking tips! I will definitely keep reading. I just made these – so awesome! some turned brown but with your warning I knew that they were to be avoided. And I had never used smoked paprika before and it may now be one of my favourite spices. Thanks so much for all the hard work you and the chef do – I really appreciate it. Ohhh yes, I think I shall make these tonight. They are such tasty treats! Finally got around to these because I thought I’d be the only one eating them. My 21 month old’s finger’s looked like your daughter’s. Covered with little green flakes. She LOVES these! Thank you!! I really, really cannot stop eating these. I keep making them again and again, searching for kale on sale everywhere I go. Try dillying them up with chile powder or chipotle chile powder. Wowza!! Count us among the nay-sayers! The first couple are OK–mostly because it’s oil and salt! But after that, the taste is cloying and the smell–whew! Really fouled up the house. Even open windows to the cold air didn’t work that well– finally, made rice for tonight’s dinner early and that purge the place–but the containers still stunk. It even left an after taste that affected other things we ate. Even some regular chips and salsa couldn’t quite get the taste out. Sorry, but this is one we won’t ever be making again! For those who are looking to up their leafy green intake, try extra leaves of leaf lettuce on sandwiches and broccoli as the vegetable with dinner (cooked tender with some butter). I have an excalibur dehydrator that I make my own fruit leathers and dried fruit or chips . My two little ones are always sneaking the leathers and chips when they hear the dehydrator on. So good and what is left which is rare stores easily for a year. Also mint yogurt with chopped walnuts, raisins, onion , cucumber & salt and pepper. Persian yogurt salad so good. another great treat is a cantalope smoothie…it tastes like an orange creamsicle but is completely vegan…just make sure you wash the outside of the cantalope as well as all melons before cutting into them…place 2 cups of cut up chunks in blender add 1/4 cup orange juice (you can squeeze it yourself or get 100% juice) you can try different melons but Renee age 5 came up with it and we have loved it ever since.. it is great when cantalope season comes! Hmmm. Sounds good, but what if you don’t have a salad spinner? Well, you can do what we did when there were no salad spinners: rinse the kale and dry it with a towel! I’m the new kid here! :-D. I tried these and LOVED THEM!!! Can they be stored for a week or so? Just wondering if I can make them ahead of time. Thanks!